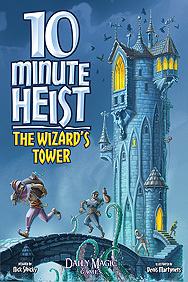 In 10 Minute Heist: The Wizard's Tower, you and your fellow thieves steal as much loot as possible! The Wizard has many items for you to collect, and you'll be rewarded for nabbing sets. But be careful, some items are cursed and they could lower your standing in the thieving world!